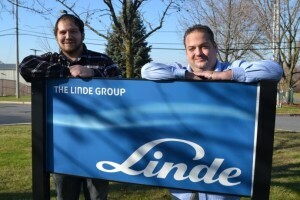 Curtis Marler (right) with Linde Electronics & Specialty Gases in Phillipsburg, NJ, hired and trained lab technician Frank Pinheiro (left) through Ready to Work New Jersey. This story was originally published in the January 2016 issue of New Jersey Business, the magazine of the New Jersey Business & Industry Association. The author is Christopher Biddle, President of Biddle Communications & Public Relations.